Your Independence. Your Website. Your Brand. Your Presence on the internet to advertise, rent, and manage your property. Finally, you are in control. Whether you have one property or multiple properties, get an awesome website for each property you own. GetawayX® websites have been designed to work beautifully on tablets and smart phones. They are simple and easy to set up, edit, and modify. Your site will have everything you need to "sell" your property to prospective renters, and to manage your bookings. As explained in the book, having repeat renters is the #1 key for stress-free success in renting vacation property. Your goal should be to have 100% of your renters be repeat renters. GetawayX® helps you achieve this! Easily track and download all of your previous renter's data for mailings, and for your email campaigns. Worried about renting to a new renter who just inquired about your property? All renters who have booked trips with a member of GetawayX® will be rated by the property's owner/manager. Having this feedback about a renter from a fellow property owner is priceless! Looking for a new cleaning person? Looking for a plumber? It can be very difficult to find a reliable contractor for a property located ten hours away from you! GetawayX® allows members to enter their contractor's information so that we can share good tradesmen with all of our members! Prospective renters can log in to your website and request a date via your online reservation system. If the time requested is available you will be notified about the request, which you can modify, accept, or deny. If approved, the dates will be automatically marked off as reserved on your availability calendar. Flexibility! If you want to accept online payments, GetawayX® provides you with two ways. The first is using your PayPal™ account, and the second allows you to direct renters to your own payment processing provider. If you want to make money with your new GetawayX® website, you can easily run Google AdSense advertising on it.1 Another great way to generate additional income is to have an online store which sells products that promote your property! Not only does the merchandise create income for you, it creates "stickiness" with your renters, and is another great way to advertise. Both are simple and easy to implement at GetawayX®. Plain and simple, GetawayX.com offers everything you need to rent and manage a vacation rental property. Sign up and check it all out — there is no obligation, and best of all, it is free. The way our property search engine works is simple. When a renter searches for a property to rent, the results are displayed in a random fashion — which means that all owners are equal. The renter will click the property they like and be sent to your website..
2 - All terms of the rental exchange are privately negotiated between the owners. GetawayX® is a one-stop shop! Search for vacation properties to rent, review all of their details on the property owner's website, then easily reserve, book, and pay for your trip all on the property owner's site. That means it's all here — all in one easy to use website! Once you create a free account, it can be used on any of the property's websites at GetawayX® so you don't need to have to create multiple ids for every place you want to book a trip. 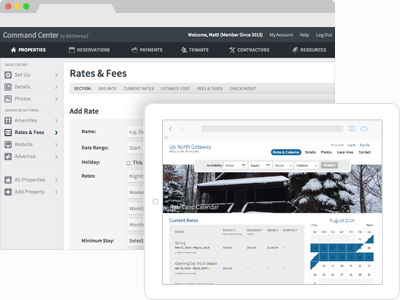 From there, you can manage all of your reservations for all the GetawayX® property's you book with on one simple to use page under your account. That's right, you won't need to login to multiple sites to manage your reservations. It's all here! 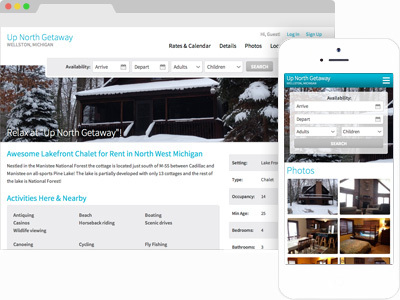 Each vacation rental property on GetawayX® goes through a process in order to be a member of our community. Once you have one trip under your belt, you can become a "trusted traveler" which can minimize the screening process for your next reservation through GetawayX®.